BERNIE'S BLUEPRINT FOR 2020. AN INSTANT NATIONAL BESTSELLER. 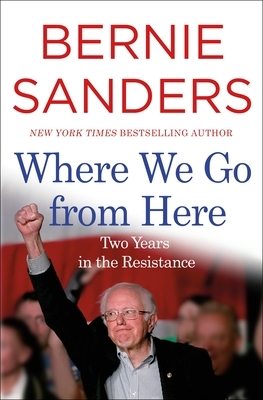 In Where We Go from Here, New York Times bestselling author Bernie Sanders reveals the blueprint for his 2020 presidential run by chronicling the day-by-day struggles that he and his progressive colleagues have waged over the last two years in the fight against Donald Trump's reactionary agenda and for a government that works for all, not just wealthy campaign contributors. At home, Sanders has helped lead the fight for Medicare for all, fought for workers desperate for higher wages, and supported immigrants in the DACA program and children affected by gun violence. He has stood with the people of Puerto Rico devastated by Hurricane Maria, as well as veterans, teachers, the incarcerated, the persecuted, and all those who are too often ignored by Washington. Abroad, his voice has been clear that we need a foreign policy that strives for peace—not war—and international cooperation to address the crisis of climate change. The good news is we're making progress. People all across America are standing up to the most dishonest and reactionary president in our history. They're taking on establishment politicians who've turned a blind eye to the concerns of everyday citizens. They're fighting back against the oligarchs of Wall Street, who would happily see our children do worse than their parents so long as the Dow does better. And the general public continually demonstrates that we are more united than the media would allow us to believe, and what we agree on are largely progressive ideals. Maintaining a vibrant democracy has never been easy, and in these dangerous and unprecedented times, it has been more difficult than ever. Bernie Sanders shows, however, that we can repair the damage Trump has done—and create a nation based on the principles of economic, social, racial, and environmental justice.